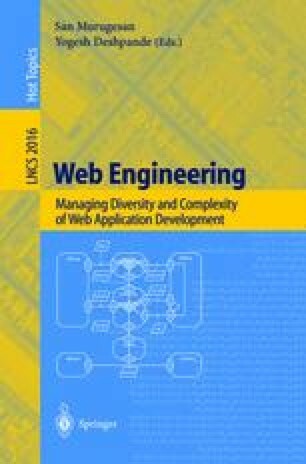 From a software engineering perspective the World Wide Web is a new application platform. The implementation model that the Web is based on makes it difficult to apply classic process models to the development and even more the evolution of Web-applications. Component-based software development seems to be a promising approach for addressing key requirements of the very dynamic field of Web-application development and evolution. But such an approach requires dedicated support. The WebComposition Process Model addresses this requirement by describing the component-based development of Web-applications. It uses an XML-based markup language to seamlessly integrate with existing Web-standards. For the coordination of components the concept of an open process model with an explicit support for reuse is introduced. By describing application domains using domain-components the process model addresses the need for a controlled evolution of Web applications. Berners-Lee, T. Information Management: A Proposal. http://www.w3.org/Proposal.html, URL checked 10.04.2000. Institute: Software Engineering Institute-Domain Engineering. http://www.sei.cmu.edu/domain-engineering/domain_engineering.html, URL checked 04.04.2000. Payton, T. Megaprogramming-Facilitating a Transition Towards Product-Line Software. http://source.asset.com/stars/darpa/Papers/megaprog/terimega.html.